It’s no surprise that preventing a data breach now tops compliance as the number one reason for protecting enterprise data. In 2013, Target starred in arguably one of the biggest data breaches ever, affecting upwards of 40 million card accounts and setting the precedent for 2014, where Neiman Marcus, Michaels, UPS, JP Morgan, Sony, and many other large corporations shared the data breach spotlight. While the breach trend seemed to plateau in 2015, Anthem, LastPass, Army National Guard, and even Harvard fell victim to data disasters. While IT spending on data security is at an all-time high, corporations are moving their IT infrastructures to the cloud, opening a whole new can of worms in data security. Moving to the cloud makes data security a little more difficult because A. We’re not exactly sure where the data lives up there, B. Sharing infrastructures can make things a little loose in the confidentiality department, and C. Now we’ve got a service provider to potentially worry about. 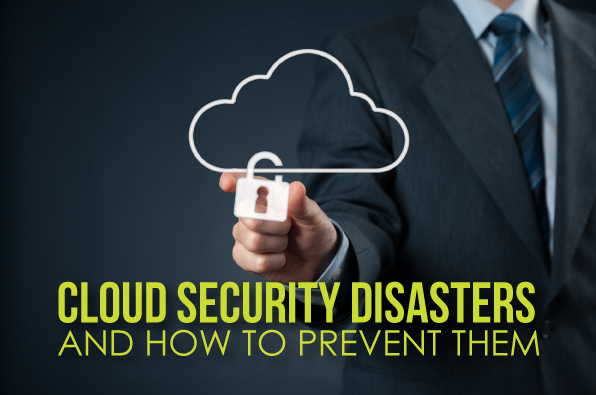 So without further ado, here are three ways to prevent cloud security disasters. If you have been known to black out your account number on your credit card receipt before handing it back to the server at a restaurant, you already know where we’re headed here. It’s a good idea when deciding what to have stored in the cloud, to filter out the sensitive data. If you wouldn’t want it floating around the internet, then don’t put it out there. This one is pretty self-explanatory and many cloud service providers will do this for you or you can do it yourself with data encryption software. If you must store a sensitive document in the cloud, password protect it. Don’t put all your eggs in the cloud. That’s a scary, scary idea. There are a number of ways you can backup the information you store in the cloud, but manually, to a disc or drive will ensure you have your stuff when you need it, regardless of internet access or in the event of a major data catastrophe. Hopefully this little list has helped you understand the data security issues that come along with cloud storage. And hey, if you need someone to help you protect your data – you’ve come to the right place!